This is a simple 3-page application that demonstrates the basic usage of React Navigation as a navigation tool. It is extremely easy to understand. This step-by-step tutorial will take you through the basic concepts. We are using NativeBase as the UI library to design our pages. We are creating a 3-page application with buttons on each page that takes us to the other page onPress. With our basic project setup we can now start building our App. Make a folder at the project root by the name of src. This is going to be the first landing screen of our App. We are going to implement the navigation logic here. For our purpose here, we have used DrawerNavigator for navigation through the entire app. Further screens will have nested navigators in them. Go ahead and add the following file in your project. Here we have simply added some buttons, each to openDrawer or navigate to other components. The navigation object is available as a prop to us as we declare this component inside a DrawerNavigator in index.js. Here we have simply imported all the screens we will be needing. We will be building these screens in the coming sections. These screens in fact are router components which themselves have multiple screens. We pass the screens to the DrawerNavigator as shown above. Note how we have used a custom NativeBase components using customComponent prop and we pass our custom drawer component. This is going to be our custom drawer component where we put buttons to navigate to different screens available. Navigation object is available as this.props.navigation since we passed the props in the HomeScreen component. This screen comprises of TabNavigator component. We are going to have three screens here to chat to three different people. We will also create our own custom component for Tabs. Its done as follows. We have simply imported three screens to work as Tabs as shown above. We pass these screens to TabNavigator component. Notice how we pass our Tab component through tabBarComponent prop. Navigation is available as props. This screen includes example for StackNavigation. We have Navigation as a StackNavigation prop here. In the UI, we have different buttons to navigate to screens on stack. Notice how we imported screens above. Notice how we passed the DrawerNavigator prop inside our Profile screen header above. This screen is a simple part of StackNavigation, we have a header with a back button as shown below. 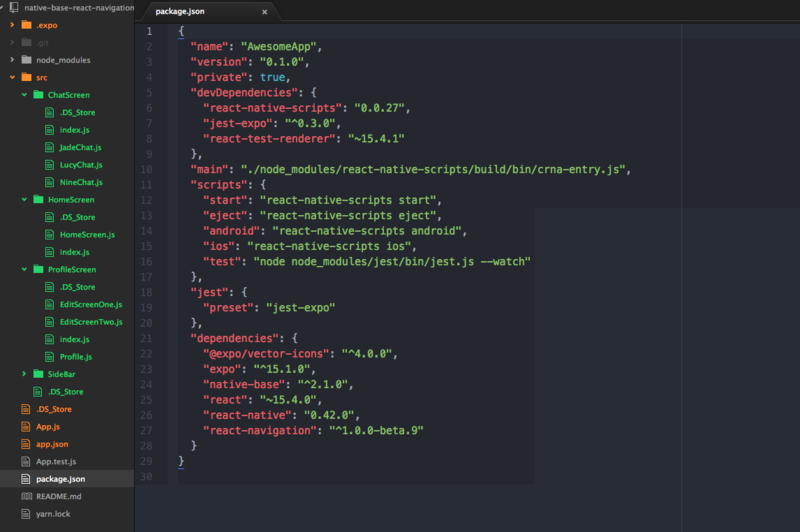 Lastly we import our routes component from HomeScreen to our App.js file as shown. Note how we have loaded fonts for NativeBase since we have used expo here. All has been taken care of now. Build and run.